Ever wonder why a pair of running shoes strung over a power line might mean? That is what the Toronto Star set out to figure out. Apparently an interesting culture has grown up around explaining why shoes are found strung around power lines. In fact the art of stringing shoes over power lines is called "Shoefiti". The only constant about the culture of Shoefiti is that nobody can know who strung the shoes up in the first place. In other words, shoes must be strung over power lines in the cover of darkness in order to maintain the mysteriousness of the culture. In Aurora there is the odd pair of shoes strung over power lines. Observances of Shoefiti in Aurora continues to be here and there. When it was pointed out that possibly the shoes symbolized the possibility of drug dealers marking their territory it got me worried. Was Aurora going to pot in the last ten years around the intersection of Yonge Street & Murray Drive? Not likely, but the dangling of shoes in that area under this premise got me worried. 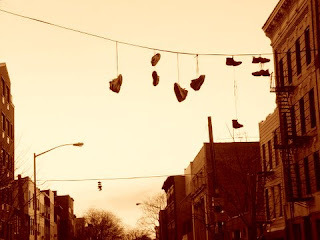 In New York City, the shoes hanging from the heavens seem to abound. Again, the thought of the drug culture got me thinking about my safety. However, like most people, I brushed it off as being one of the weird things of New York. But the thought about drugs lingered in my mind. In the Toronto Star article the Toronto Police Service laugh off the idea of Shoefiti having anything to do with drug culture. I tend to agree. Why would drug pushers run around hucking shoes so precisely so that they land just perfectly over the power lines? It makes no sense. The druggies would make more money by spending there time on cultivating better drugs and more clientele instead of wasting their time and money on buying and stringing shoes over power lines. However, as the article mentions, this did not stop the Los Angeles Police Department from having an anti-Shoefiti campaign in late 2002. Even more thought provoking is the question of "who came up with shoefiti?" Was it some kid who was picking on his younger brother by tossing his shoes in the air that just happened to land on a power line? Could the parents not figure out how to retrieve the shoes and thus the shoes were left there? Did others, out and about doing their daily routines, wonder how the shoes got there in first place? Is this how shoefiti started? We will never know. But shoefiti has quite the following. There are several blog entries, websites and You Tube vidoes dealing with the culture of Shoefiti. Perhaps the most interesting one is Shoefiti.com. This website investigates the different art forms of Shoefiti and how features how some shoes are artistically hung. Pictures of shoes abound on Shoefiti.com from cities from around the world. This awe inspiring website is worth the visit. Did Shoefiti explode with the advent of the digital camera? Did people take pictures and blogging about the mysterious shoes help to advertise the growing Shoefiti culture? Or did the picture taking of Shoefiti become a recent thing and the culture was already well developed and the picture taking only help to further fuel the shoe dangling culture? The culture of Shoefiti brings forth a lot of questions and only a few possible answers. But really only one question that nobody can convincingly answer: What on earth does it mean?